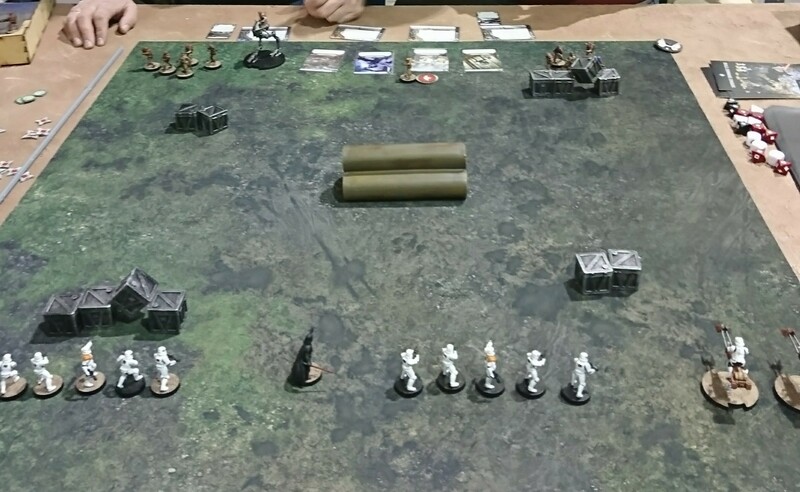 I had the chance over the past few days to play a couple of games of the long-anticipated new miniature wargame from Fantasy Flight Games – Star Wars: Legion. This is the fourth miniatures wargame that FFG have produced, following on from X-Wing and Armada in the Star Wars universe, plus the fantasy battle game Runewars. Last Thursday evening, store owner Ian Mann invited us over to Boards & Swords Hobbies in Derby to play the game for the first time. I ended up taking on the Great Guru himself (which was a bit of a surprise, as Mr. Luff is not known as a fan of Star Wars) whilst ‘my other mate Dave’ observed and heckled. As you might expect from Fantasy Flight Games, the components are, with the odd exception, excellent. The miniatures look great – they are around 32mm in size (the same size as FFGs Runewars miniatures) which, as has been previously point out by numerous sources, makes them noticeably bigger that the figures from Imperial Assault – FFGs Star Wars ‘dungeon crawler’ miniatures boardgame. They are well detailed, which means that you can give them a very good paint job. It is worth noting that the plastic these are made from does not respond to plastic glue, so will have to user super glue to assemble your models. As well as the models, the core box contains eight barricades to act as basic cover, 3 movement tools and a 4-part measuring stick. There are also numerous cards and tokens, all of which are of FFGs usual high quality. The artwork on the cards is excellent – something which seems to be taken for granted these days, but is well worth pointing out. The measuring stick is the only component that looks a bit cheap – however, you could always replace it with a piece of dowel or a tape measure, should you so wish. We played the first scenario from the ‘learn to play’ guide, which uses a cut down version of the rules to get players ‘up and running’ with the game – I actually think that this does the game a disservice as two key parts of the game are missing, but more of this later. The game uses alternate unit activation, with a twist of command and control. Players have a number of command cards, which can be used at the start of a turn to ensure that a number of units receive activation tokens early (as long as they are in command range). Any activation tokens not used in this way placed into a container and are drawn randomly during the rest of the turn. On their turn, a player may activate a unit that has a token next to it, or draw randomly from his container. That unit may then take two actions, including Move, Attack, Dodge and Aim, and also Standby (rather like overwatch), Recover and Card Action. In combat, models roll a number of dice and count the number of ‘hits’ scored – the defender then rolls to see how many of these attacks can be blocked. Various modifiers can be applied to give bonus hits or blocks. The mechanic will be familiar to anyone who has played FFG games such as X-Wing, Imperial Assault or Descent. As I said, one of the key mechanics in the game is not part of the ‘learn to play’ set-up, and that is Suppression. This works in a similar way as ‘Shock’ in Too Fat Lardies games, or ‘Pinned’ markers in Bolt Action. Gain too many suppression token, and a unit can have its number of actions reduced, or panic entirely and flee from the battle. As such, managing suppression is a key part of the game, and this is where the Recover action become vital. The units in the game can be modified in a number of ways, being given upgrade cards that represent extra weapons, munitions or skills. It’s these cards that add massively to the game, as they give such things as heavy weapons, grenades and force powers – Darth Vader is intimidating enough as it is, but give him the ability to hurl his lightsaber or an extra dodge action (which can be used to deflect shots back at the firer) and he is a truly terrifying prospect. Overall, the play of the game is cinematic in feel, as you might expect. Whilst it’s always fun to play a wargame – especially with such a cool theme as Star Wars – it is good to note that Star Wars: Legion has a much larger tactical depth to offer. Its Command and Control and Morale mechanics look to be excellent – these are vital elements of any decent wargame, so it’s very encouraging to see how these have been interpreted. Star Wars Legion reminds me somewhat of Bolt Action in how it plays, but with extra bells and whistles. It’s encouraging that FFG seem to have put a lot of work into this game and have produced a decent game – it’s not simply a basic set of mechanics with a shiny Star Wars front end. It will be interesting to see what expansions FFG have planned for this game – when it comes to different troops and vehicles, many more Imperial options spring to mind than the poor Rebels – perhaps they will have many more Commander options to choose from? I will give a more in-depth review when I finally get my copy, but initial plays now mean that I am even more impatient for this to arrive! Reblogged this on Boardgame Monkeys. Suppression is by far the most unfun mechanic in this game. Think of it as Stress in x-wing but ALL units can dish out stress when they ATTACK!!! Want to shutdown a storm trooper unit, just have 2 squads shoot at it and they will be running away. No actions, no shooting, just leaving the battlefield. I think suppression along with many other bad game designs will Kill Legion.